This section tells part of the story of the Murray and Young families, Scottish pioneers who emigrated in the 1820's to Van Diemen's Land from the other side of the world seeking fortune in new lands. They were accompanied by some of their friends and relations, the Reid, Young, Scott, Thomson and Macqueen families. They married amongst themselves as well as other new immigrant families including Nankivell, Strachan, Stodart and Calverts. Collectively they made a major contribution to the early settlement of both Van Diemen's land and parts of Victoria. Many of their Tasmanian descendants married members of other families founds in this web site. Researching the Murray family’s pioneering efforts in Australia is made particularly rewarding because of the extensive family letters and records which have been retained. These date from to prior to their departure from Scotland and chart much of their progress since. One of the first to appreciate the value of these record was Clara Murray born to Andrew Carmichael Murray and Eliza Coombs Reid in Longford in 1859. She produced a family history booklet based on these records and some research, the content of which may be read here. Family anecdotes told that Hugh Murray was said to have been cousin to the Duke of Atholl, and also to the Duke of Buccleugh and that his daughters spent many holidays at the Duke of Buccleugh's seat and that Elizabeth Tindall Coombs (daughter of Hugh and granddaughter of Thomas Murray) often spoke of their visits, and of the meals, where the servants sat at the same table, but ‘below the salt'. Unfortunately, some of the anecdotes and Clara’s findings or assumptions that she made in respect to the Murray’s origins in Scotland have proven to be incorrect. Y-DNA matching shows that there was no direct connection to either of the above Dukes and that Thomas Murray’s ancestors may not have been Murray. The earliest identified direct ancestor of David and Hugh Murray is Thomas Murray of Aberdeenshire, who married Jean Tindall in about 1750 William Tindall and Mary Phin, in 1750 in Scotland. Jean was born in 1730 in Scotland and died in 1800 at age 70. They had four children: Thomas, William, Isabella and Hugh. 2-Thomas Murray was born about 1750 in Scotland. 2-William Murray was born on 6 Feb 1752 in Edinburgh, Midlothian, Scotland. 2-Isabella Murray was born about 1756 in Scotland. 2-Hugh Murray was born about 1754 in Edinburgh, Midlothian, Scotland, died on 22 Dec 1795 in Edinburgh, Midlothian, Scotland aged about 41, and was buried in Canongate Kirk, Edinburgh, Scotland. Hugh married his first cousin Anne Young, daughter of Thomas Young and Elizabeth Tindall, on 26 Oct 1782 in Midlothian, Edinburgh, Scotland. Their mothers were sisters. Anne was born on 7 Aug 1759 in Peebles, Scotland, died on 20 Dec 1838 in Hobart, Tasmania at age 79, and was buried in St Andrews Presbyterian Cemetery, Hobart. Among the Murray's large circle of connections were the Stair, Scott, Young, Carmichael, Cross and Imlach families. Four of these families held the position of Writer to the Signet, Edinburgh. This was a high legal position to which a lawyer was elected by his brother lawyers. A nephew of Anne Young was Lord High Advocate of Scotland. As a youth he is spoken of as clever, very kind and attentive to his aunts, and very ambitious. He was witty, and when on the Bench was noted for his caustic comments. Lord Young was sixty years in Parliament. His closest friend was Lord Rosebury, who owned an adjoining estate in Derbyshire. 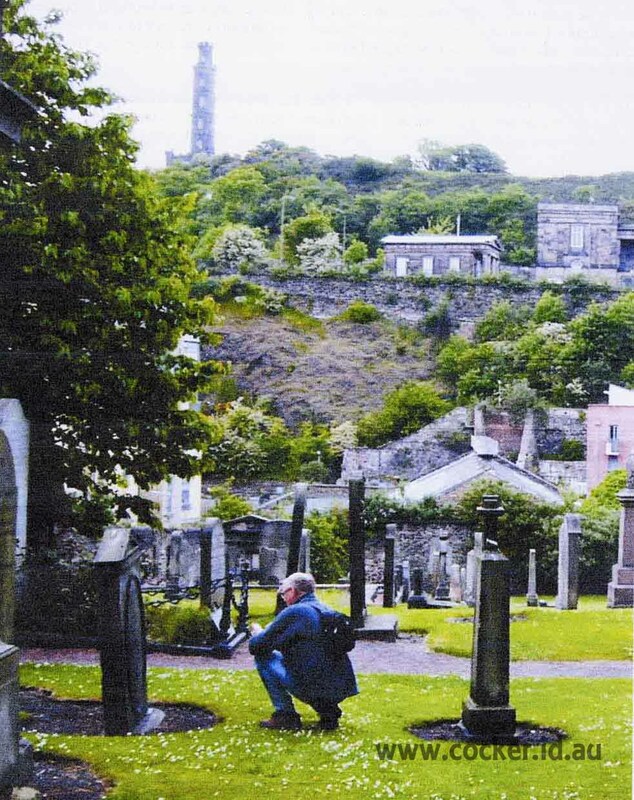 Hugh Murray died in Edinburgh and his widow married John Thomson, watchmaker. Anne and John had four children. Their story is told as part of the Young Family history. Hugh was buried in the grounds of Canongate Kirk, which is the Parish Church of Edinburgh Castle, about half way down The Royal Mile from Edinburgh Castle to Holyrood Palace. 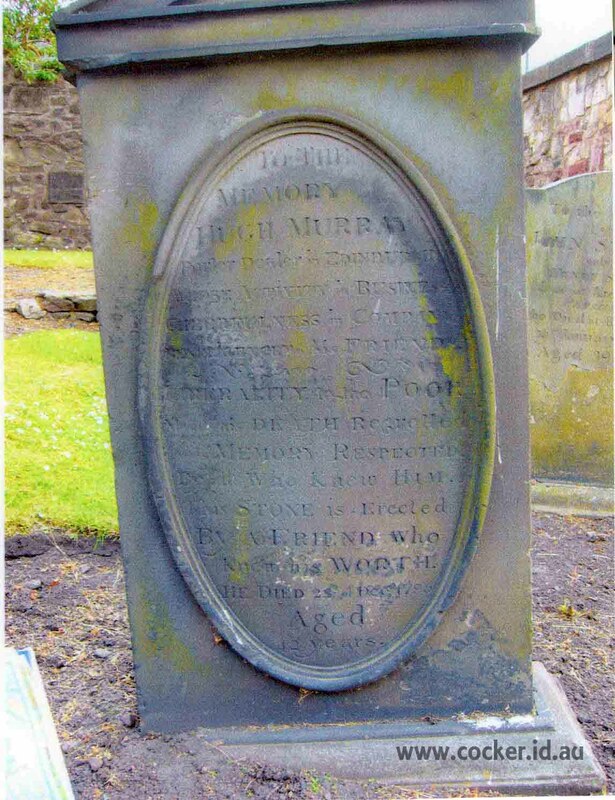 ''TO THE MEMORY of HUGH MURRAY Porter Dealer in EDINBURGH Whose ACTIVITY in BUSINESS Cheerfulness in COMPANY BENIFICENCE to his Friend (scroll) LIBERALITY to the POOR Makes his DEATH Regretted His Memory RESPECTED By all who Knew Him. This Stone is Erected By a FRIEND who Know his WORTH. HE DIED 22d of Dec 1795 Aged 42 years". This transcription was taken in June 2006 by Denise and Malcolm Murray. The punctuation and the emphases by the use of capital letters are as near as possible faithfully reproduced. The daughters of Hugh Murray had as their tutor Lindley Murray, the famous grammarian. They had, moreover, a sound practical education. Annabella, in a letter to her sister Betsey, dated 11 Aug 1813, from Firth, where she is spending a holiday, tells that she is learning "to shear and likewise to make the shearers' porridge." In the same letter she makes reference to Mrs. Thomson's illness and also mentions a proposed visit to Melrose. Second Son David wrote to his sister, Elizabeth Tindall Coombs, on his first visit to London. As I promised, I now sit down to write you from London. To attempt to write you any news, however, from such a place as this, would be the task of much more than a day, of course much 'more time than I can spare here-besides the novelties which daily crowd on me are so many that I would be at a loss how to begin an account of them. I will tell you all about the lions when 1 come home-these last I saw a few minutes ago. Adjoining them is a hall in the tower 350 feet long, in which are stands of arms for 200,000 men. A man who, from his dress might be supposed an emperor, shows this prodigious collection of the weapons of murder. T think the time is near at hand when they may he safely beat into ploughshares and pruning hooks-what a vast quantity of shearers and ploughmen this would equip- but I observe I am insensibly entering on the stories which I was cautioning yon not to expect. Maybe it was done by design, that I might not send you a carte blanche in place of a letter, for you know the sole object of my promise was to inform you when I would be in Edinburgh again. Well - to come to the point- Our vessel is expected to sail from the Thames on Sunday, which is the 27th and if we have no quicker passage down than we had up (10 days), I will not he home till the 9th; at or near which time expect to see me. You can't conceive two cities to be more different than Edinburgh and London. I feel myself like a foreigner in a strange country; it is with difficulty I can make myself understood by the cockneys. Andrew Carmichael and Lillias Cross, eldest daughter of John Cross, merchant, Glasgow, were married at Glasgow on the 2nd February, 1784. Mrs Carmichael was a literary woman and a great entertainer. She was known in her young days as the "Glasgow Belle." Her daughters, Marion and Jean, married David and Hugh Murray. Another daughter, Martha, married James Hume. Thomas, the eldest son of Hugh and Anne Murray, was a Captain in the 91st Argyleshire Highlanders and took part in the campaign before Waterloo. In a letter dated 2nd September, 1815, from Bois de Boulogne, he quotes from his journal of the 10th and 17th June: "On the march to Waterloo we bivouacked at Enghien, and marched to Gramont, where the water issued from the mouth of a naked boy." After leaving Enghien they heard of the death of the Duke of Brunswick and others. The letter continues: "Wellington held a grand review of cavalry to-day, 150,000; the Prussians are to be reviewed on the 15th inst." He mentions having heard of his brother, Hugh's, marriage to Jean Carmichael, and adds that he is bringing present for the bride from Paris, "one of the geegaws that the ladies love." Captain Thomas Murray died in Jamaica in 1826. The Urania brings 62 passengers, two children having been born on the passage among the number are the following: Mr. Hugh Murray and family, Mr. James Reid & family; Mrs. Newton, Mr. Robt. Young, Mr. John Stirling, Mr. W. Robinson, Mr. W. Paton, Mr. Walter M'Queen and family, Mr. John Scott, Mr. James Thomson, Mr. W. Thomson, Miss Ann Thomson, Mrs. Thomson, Miss Agnes Scott, Mr. Walter Davidson, and W. Oliver, and several others. He was the son of George Young and Christian Beverley). The Urania arrived at the port of Hobart Town in mid-summer 14 Jan 1823; the journey took about six months. Between them, the Murrays brought as much in the way of stock and equipment that it was felt could safely make the journey of six months at sea in the confined space of the ships and also one domestic for Mrs. Hugh Murray (nee Jean Carmichael). Hugh Murray named his grant of 1760 acres, which he selected on the Macquarie River near Campbell Town, St. Leonards when the foundation stone of his house was laid on 7 Feb 1824. James Reid called his grant Green Hill. Meanwhile news of the Urania was anxiously awaited in the Old Country. 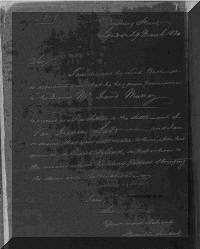 No letters from the Murray family were received till No­vember 1823, sixteen months after their departure. After acknowledging these letters from Hugh and Betsey, brother David announces his intention of following them. His letter to his mother under the same seal follows. I have long looked for a letter from you but have been dis­appointed, and it is not likely now that I will be gratified by the receipt of that, or those, which surely are on their way; for know you, and tell it to Margaret and Hugh, Betsey and Anna­bella, that about 1st of April I embark with wife, weans and all my household on board the Portland, for the Land which con­tains such a large portion of my relatives and friends, tell the news also, I have the vanity to think they will be hailed as good ones, to my other sister and brothers. I send this letter by London, but for the reason that I may he in Hobart-town before it. I will not enter upon news, but reserve such as I may have, to be orally delivered, a wise scheme, to reserve for myself that importance which otherwise might be given to my letter-but I will make this sheet of paper tell you a truth, tho' it is one you already know, that I am and will ever be, My very dear Mother. To Hugh he tells his plans in greater detail. "I hope soon to be again at your fireside, as the first page of this sheet will inform you. My own establishment in the ship is self, wife, and two darling weans, a carpenter with his wife and do., and also a coop­er, an agriculturist, Thomas's David, and a maid servant-12 souls-besides these, I have friends, Tom Young and family, Jessie Ritchie and her husband, Claud Thomson and two young gentlemen of fortune, Messrs. Pitcairn. There will be 15 cabin and 70 steerage passengers." 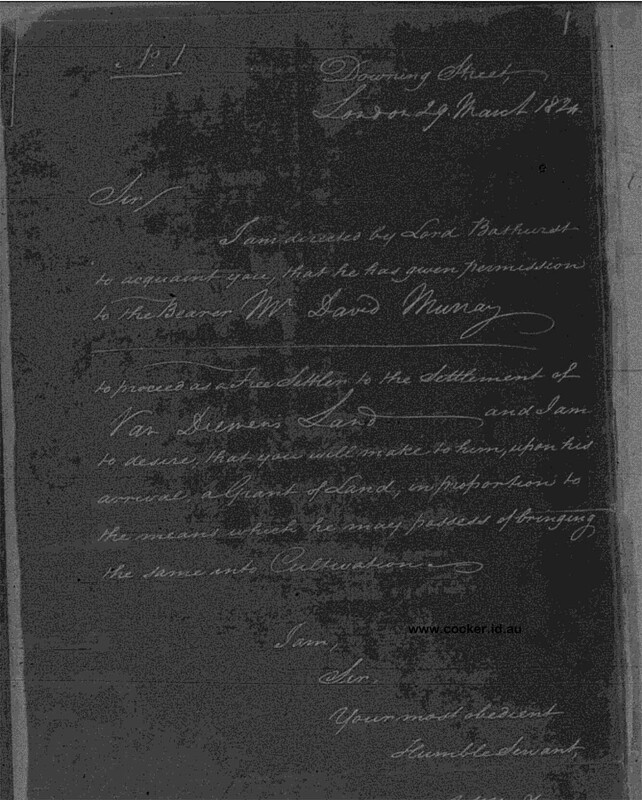 I am directed by Lord Bathurst to acquaint you that he has given permission to the bearer, Mr David Murray to proceed as a free settler to the Settlement of Van Diemen’s Land and I am to desire that you will make to him, upon his arrival, a Grant of Land, in proportion to the means which he may possess of bringing the same into cultivation. Van Diemen's Land was opened to free settlers in 1815. Settlers began to take up land in the Campbell Town district in the early 1820's. The area between the Ross Bridge and the Elizabeth River was originally reserved as a government farm of nearly 100,000 acres. This area was not available to free settlers until 1821 when Governor Macquarie named Campbell Town and ordered a village to be laid out there. By 1824 when Thomas Scott the assistant Surveyor General prepared his chart there were over forty grants shown as having been made along the banks of the Elizabeth and Macquarie rivers and the southern bank of the South Esk River. Many of these grants were made to Scottish settlers who came out together. Thomas Scott, who later married Hugh and David's niece Anne Reid, made many sketches and plans. 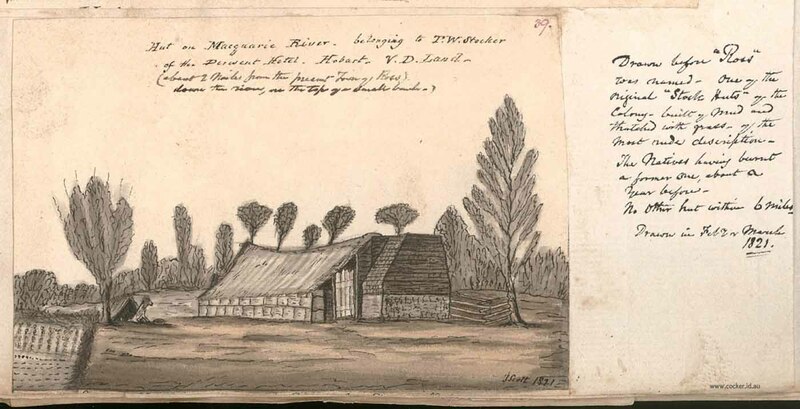 This sketch by Thomas Scott of an early settlers hut on the Macquarie Rriver is reproduced here courtesy of the State Library of New South Wales [a128188]. Hugh Murray obtained a grant north of Morningside which he named St. Leonards. His brother-in-law James Reid received a grant which he named Green Hill and Robert Young received a grant which he called Beverley. John Thomson, also an immigrant on the Urania, took up land opposite Valleyfield. David Murray arrived later and settled on the property which he named Twickenham on the east bank of the Macquarie opposite the Fosters at Fosterville. The Youngs settled at Pisa and Beverley. Visits from aborigines and bushrangers always occasioned a certain amount of trepidation, according to references in David Murray's diary, but the families suffered no serious inconvenience. In fact, Hugh Murray, alone of all the whites, won the title of "King" from the aborigines because of his kindly treatment of them. "Umurrah”, son of legendary chief Kitter, was a celebrated chief of a Midlands tribe and was named after Hugh Murray because of the natives respect for him. On one occasion in 1829, during the war of extermination, a number of distressed aboriginal women placed themselves under his protection and camped near his house for a few days. David and Hugh's stories are continued under their names.